Cleaning of houses and traditional kolams displayed at entrances, pooja rooms and many more places inside houses are common events in any festival in the south of India. Kaarthigai Deepam is the festival of lights in Tamilnadu. 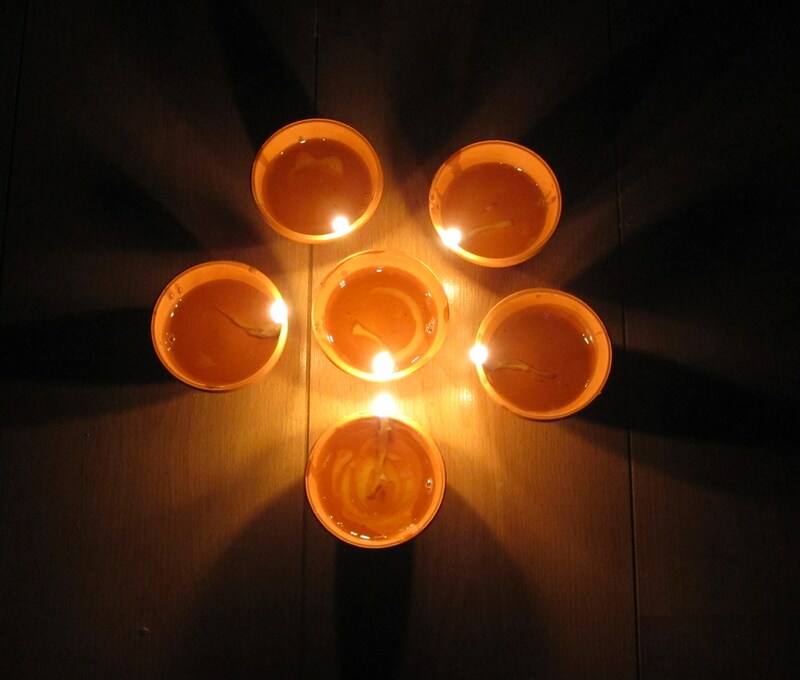 Oil filled earthen lamps – agal vilakku – lit at room entrances and windows mark this festival. Beautiful agal vilakkus placed on the aesthetically done kolams are a truly marvelous sight to watch. Kaarthigai Deepam is believed to be one of the oldest festivals of the Tamils. It is celebrated on the full moon day which coincides with the star Krithigai of the tamil month of Kaarthigai (November-/December). Many literary works mention the existence of the festival thousands of years ago. See https://dosaikal.com/2011/10/08/deepavali-the-sweets-and-savories-story/ – para titled – Deepam and Tamilnadu. More than the religious aspects, I have always concentrated on the traditions based on the ancient culture. Here too, emphasis is on the tradition behind the festival. Temples have always interested me due to their historic, architectural and literary importance to ones’ roots. Kaarthigai Deepam or Thirukkaarthigai is celebrated in all Shiva temples throughout Tamilnadu. But Thiruvannamalai temple holds a special place. Lord Shiva is worshipped in the form of fire – Agni Lingam in Thiruvannamalai. Karthigai Deepam festival celebrated during the full moon day in November–December during which a huge beacon lit on the top of the hill. It can be seen from miles around and believed to be Shiva’s lingam of fire joining the limitless skies. The event is witnessed by 3 million pilgrims. During each full moon day, the Annamalai Hill is swelled by close to 1 million pilgrims who do a girivalam (circumnavigate the base of the temple and the Annamalail hill) and worship Annamalaiyar in the temple. For more information about Thiruvannamalai the sacred town and Annamalaiyar temple in Tamilnadu visit http://www.thiruvannamalai.in/tiruvannamalai/history-of-tiruvannamalai.html . The festival of Thirukkaarthigai and the lighting of lamps are inseparable. As children, we used to watch aachi and amma light those agal vilakku in all entrances of rooms. As youngsters, we were trained to light those lamps and decorate the same way as a joyful event. Now, it is the turn of my daughter to watch and enjoy! Apart from the kaarthigai vilakku, these are some of the other special things that come to memory about deepam. 1. The special kolams which I have of course not learnt! Maakolam is the traditional kolam or drawing done with rice powder and water mixture. Generally kolams are displayed at entrances every morning with rice powder. But this kaarthigai maakolam is done with rice powder mixed with water. Aachi – my grandmother -at nearly 85 is still an expert in this art. Dipping a clean white cloth in the rice powder-water mixture and making numerous intricate kolams is an exclusive art by itself. Though this is an ordinary routine on all days, earthen lamps arranged beautifully inside the maakolam is simply special about Thirukkaarthigai. 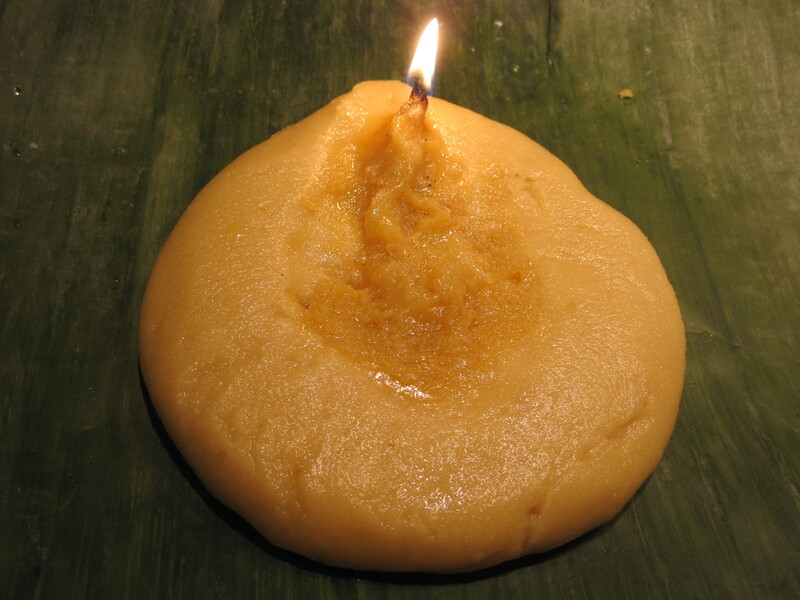 Maavilakku is an edible lamp made of freshly ground rice powder and jaggery and lit with clarified butter. Maavu means powder. This is purely for the poojai/puja – worship purpose in devotion of Lord Shiva. After the poojai is done, it is in the hands of everyone to taste and enjoy. 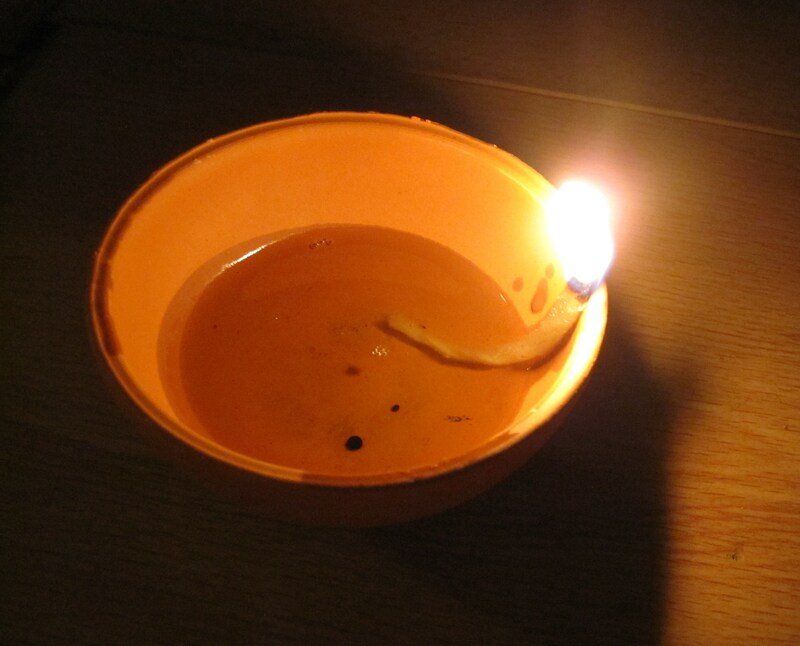 Fill in nei/ghee/clarified butter and place the thin cotton thread and light the lamp in front of Lord Shiva. Incase the powder blend is too thick to make a lamp, sprinkle water or coconut water. There are three kinds of Pori. 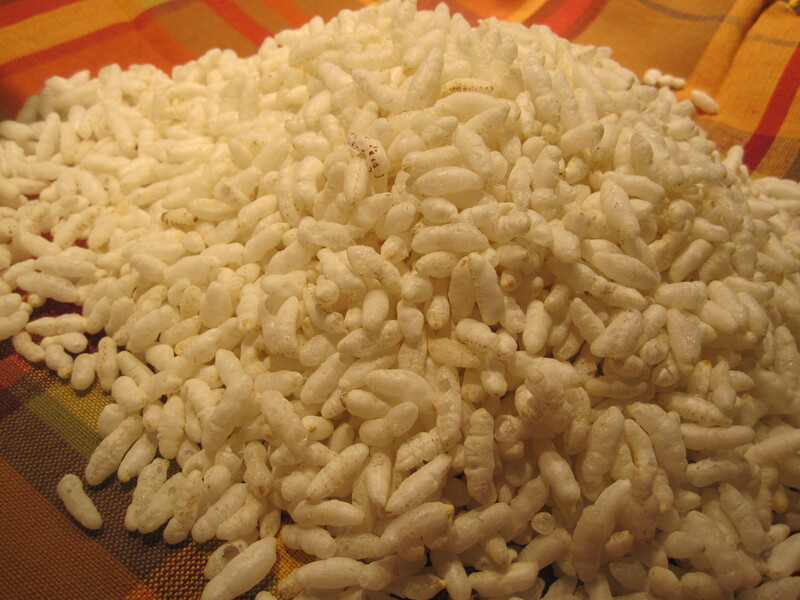 Aval Pori, the special puffed flattened rice is available mostly only on those specific kaarthigai days. In the market, the shop keeper would fry the flattened rice – aval and we bring it home fresh for consumption. I do not have this with me now. So, I tried it with the normal puffed rice -arisi pori. Making pori urundai/puffed rice sweet balls with aval pori or kaarthigai pori was out of question due to lack of ingredients. 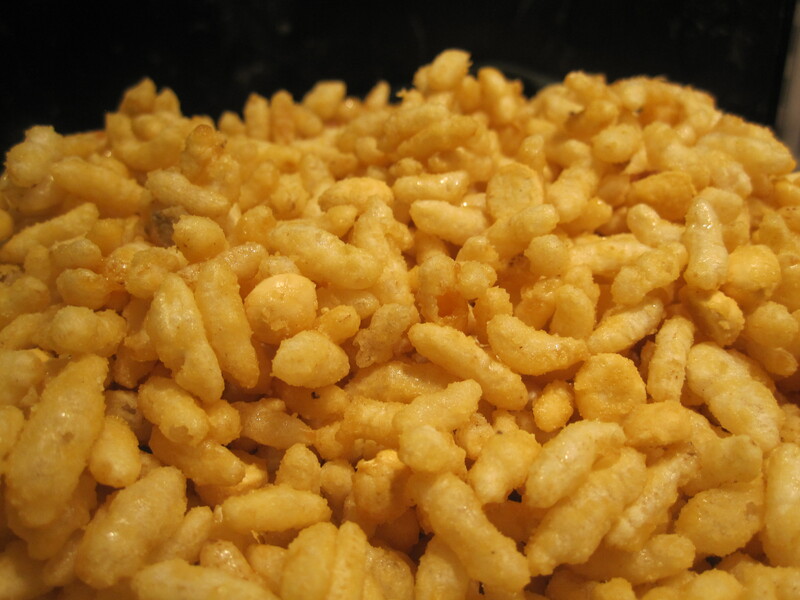 I thought of making simple vella-p-pori or jaggery mixed with puffed rice. It is served in a bowl and amma would not make urundais or sweet balls out of it. Easier for me too! 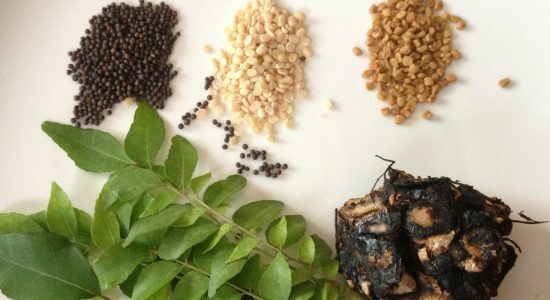 Pottukadalai/Roasted chana dal can also be added to the pori mix for added taste. This used to be one of the most exciting parts of Thirukaarthigai as children and youngsters. Dip your hands in the rice powder-turmeric-water mixture. 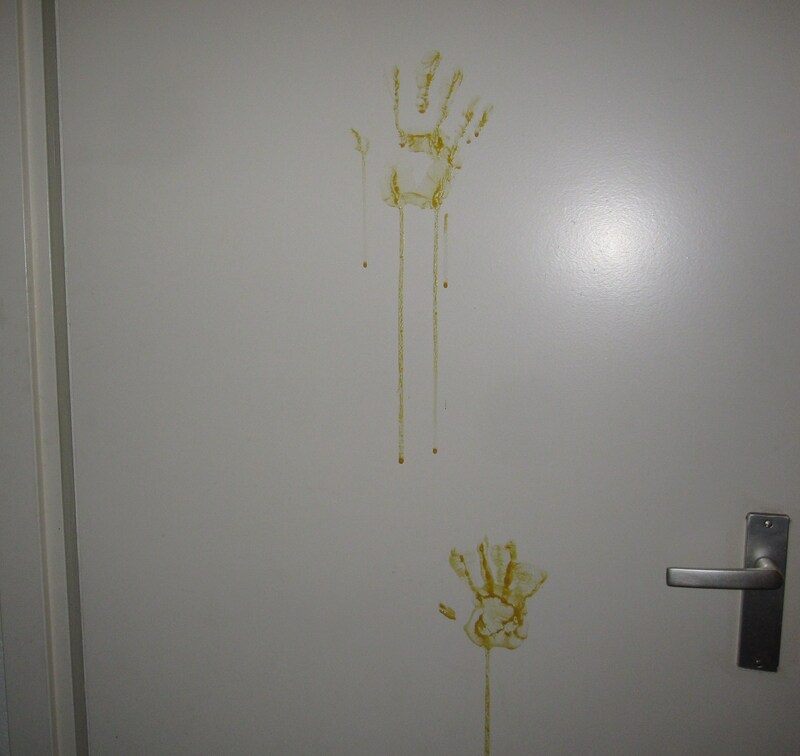 Place those hands carefully on all doors- from entrance door to all doors in the house. Keep discussing about those hands till the impression lasts! I am still trying to find the reason behind this. 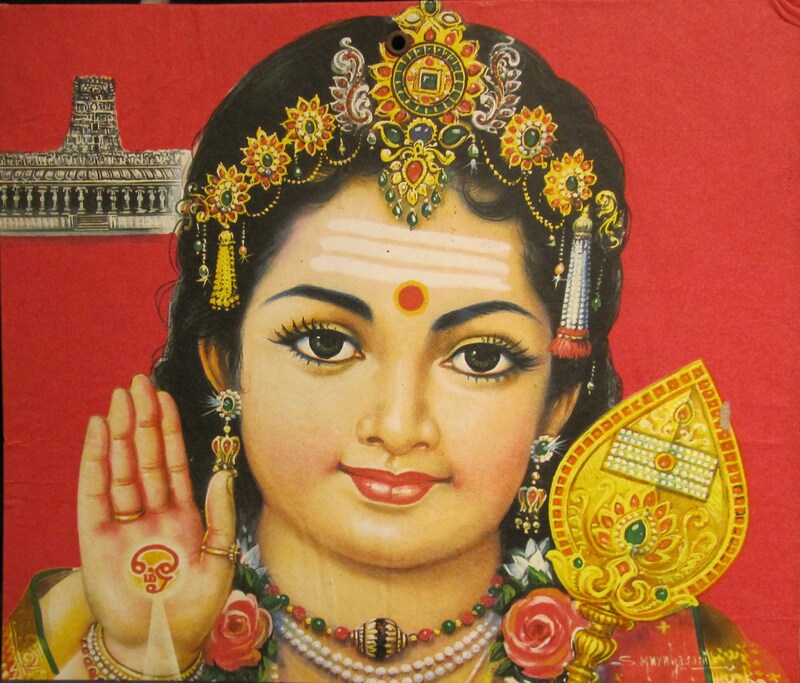 The full moon day of the month of Kaarthigai, which also co-incides with the kaarthigai star is also a special day for Murugan, the thamizh kadavul or God of the Tamils. It is believed that on this day, all his six forms were united by his mother, Parvathi and he had six faces – he is called Arumugan. In the main six temples or Arupadai Veedu, which are the six battled fields of Murugan, special poojas are performed on this day. Previous Post The Arrival of Sinterklaas!